Don Black greets me in the small office at his Scarborough, Ontario warehouse, and I earn a firm handshake from a veteran of the 20th century printing industry. He’s gruff but friendly, and keen to talk about his business and passion—letterpress and linecasting equipment and type. We walk back into the vast warehouse, and it becomes immediately apparent that Black is seriously into heavy metal, but definitely not of the musical variety. Three large rooms are packed with lead, iron and steel—a veritable treasure trove of strange, ancient machines from another age, and bank upon bank of type trays filled with individual lead characters designed to be set by hand. Banks of empty type trays rise to the ceiling. 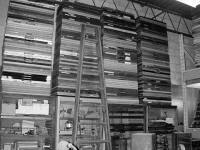 Flatbed and platen (upright) printing presses share space with cutting machines, bookbinding equipment, cabinets full of wood type and old typesetting machines loom over us, large as dinosaurs. To the uninitiated, the reference to dinosaurs might be too close for comfort. After all, three enormous rooms filled with equipment and parts dedicated to an extinct technology —what else could it be but a museum, or burial ground. Far from it. The comparison with a museum might be appropriate, but Don Black Linecasting is not where vintage printing equipment goes to die, but where it goes to come to life again—cleaned, restored, retro-fitted and put up for sale. Don, his wife Ruth and son Craig have built up a valuable business servicing artists, craftsmen, designers and the ever-growing community of fine press printers. For these people, Don Black’s Scarborough warehouse is a Northern mecca for letterpress enthusiasts. Here we need a brief historical interlude. The fine press movement had its start in the late 19th century, when William Morris turned his back on the abominable 19th century printing habits and began publishing books in the old manner, on antique iron presses using the finest papers and inks. He created an instant collector market amongst the wealthy denizens of Britain and America. More small presses sprang up throughout the 20th century, and the revival was under way. Book collectors and bibliophiles began to appreciate the nuances of books and other matter printed by letterpress, in which ink is rolled onto a form such as lead type or a wood engraving block, then paper is pressed against the form and leaves its impression in ink pressed into the paper. One often hears enthusiasts speak of the “third dimension” that letterpress printing provides, and which the current technology— offset printing— lacks. Black knows his business. Printing has been his entire life, ever since he began work at the Globe and Mail in 1953, maintaining their linotype machines. Operators of these machines typed lines into the Linotype, which in turn generated lead slugs with raised letters, formed in reverse, ready to set down on the printing press. The Globe and Mail job lasted eleven years. The new technology was coming and there was no stopping it, but the union would not go gently, and called a strike. Standing out on a picket line was not Don Black’s idea of a good time. He learned there was still plenty of work available for servicing linotype machines, so he quit the Globe and went solo, eventually forming a typesetting business with a partner. During this time, he began to network and broker the sale of equipment through his extensive list of connections in the printing business. 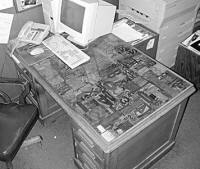 In 1974, he sold his share of the typesetting business to buy and sell equipment fulltime. As time passed, the great old line casting companies began to retool to keep pace with the times, or just passed into printing history. Either way, Black was there ready and waiting to buy up the machinery and stock of these companies, such as Canadian Linotype and Ludlow. The most poetic moment of his long career was when Black bought up the old compositing rooms from his first employer, the Globe and Mail. While Black still loves to go into the shop, he’s trying to ease out and let Craig handle more of the day-to-day work. Now we switch from Don Black, hard-headed business man, to Don Black, enthusiastic collector. A short trip from the warehouse to a cozy Scarborough suburb brings us to Black’s home, and a finished basement that houses a lifetime collection of wood and metal type, dingbats, printer’s flowers, copperplate engravings all housed in vintage type cabinets. Don Black is a type demon. 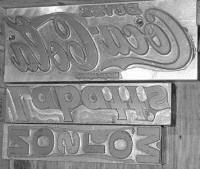 A quick lesson: wood type was used for large letters; printer’s flowers were decorative ornaments in floral or geometric patterns, copperplate engravings were acid etched illustrations, and dingbats were any of the plethora of decorative elements or characters used by printers for centuries. Black’s own collection is characterized first by its quality—many of the large wood type letters and figures look as though they’ve never been used. The cases have been cleaned and restored, and everything is in order, just like his shop. Next is scope—many of the trays open to reveal some scarce or collectible logos, such as Coke and Pepsi, T. Eaton’s and most appropriately, the masthead for The Globe and Mail. There are complete sets of large decorated letters, the kind that start the first word of the first page, entwined with vines. Black has some smaller or miniature printing presses in his basement, including one strange device with a grooved drum, where custom made type elements snap into the drum and roll down onto the paper. Also of interest was the Baby Reliance, a miniature version of a standing iron press, this one barely large enough to do a business card, but elegant nonetheless. Like all die-hard collectors, Black has an impressive library of sample catalogues and books on typography and type design. On the trip back to the shop, he talks easily about some of the characters he’s encountered over his 50 years in the printing business. Many things have changed in that time, but he’s still in the letterpress business, in spite of it all.